In a land of freezing cold winters, it isn’t just the tracks that get covered with snow – ice builds up on the overhead lines used to power electric trains, acting as an electrical insulator to prevent the pantograph contacting the wire, which interrupts the flow of current and creates a shower of sparks. So what issues does that cause to rail operations? In the United States rail operators play it safe, slowing down trains or shutting down the power supply. Wednesday’s snowstorm, complete with sleet and freezing rain, caused a few delays and interruptions along Metro-North’s New Haven Line — all thanks to a buildup of ice on the overhead wires. If such precautions are not taken, then the trains themselves might be damaged, such as this example from the United Kingdom. Train services between London and Norfolk via Cambridge and Chelmsford have suffered problems because of ice. Power in overhead cables kept tripping out in the Cambridge area, affecting all services between King’s Cross and King’s Lynn and the Midlands. An engine developed problems at Chelmsford and there were delays between Norwich, Ipswich and London. A spokesman for Greater Anglia said trains moved on a single line through Chelmsford where the broken down train was stuck at one of the two platforms. The broken down train’s equipment for picking up power from overhead lines was faulty, a Greater Anglia spokesman said. 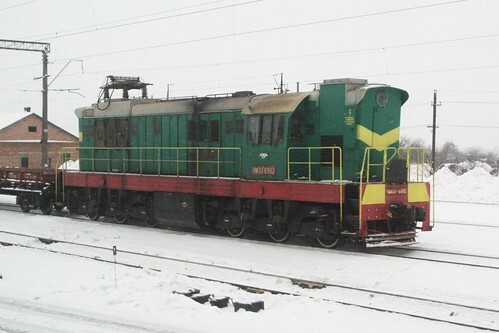 One way to prevent the ice from building up is by the use of trains specially fitted to remove it – an example is this ЧМЭ3 class diesel locomotive I found stabled in a freight yard. The device on the roof looks like a standard pantograph – the device used by electric trains to collect power from the overhead catenary wire – but is actually a special device used to clear the ice off the overhead. A вибропантограф for mechanically clearing ice from the contact wires is installed directly on type Т5-М1 (П-5), П-1В, Л-13У1 (ТЛ-13У), Л-1У1-01 pantographs for both AC and DC electric locomotives. It consists of two parts: the elongated shaped skid, which is mounted on the carriage of the current collector. Attached to each corner are the two vibrators to which the air supply pressure of 500-600 kPa through an insulated hose. The vibration has a frequency of over 4-5 thousand strokes per minute. The вибропантограф is enabled at a speed of at least 5 km/h. The velocity of the locomotive when removing ice is determined depending on the thickness of the layer of ice, the density and the completeness of the removal, but can not exceed the normal speed limit for the section of railway. The вибропантограф is able to clean the contact wires from the ice thickness of 2-3 mm, and is most effective in the initial stages of icing. A Пневмобарабан is designed to clean ice from the contact wire and is mounted directly on type Т-5М1 (П-5), П-1В, Л-13У1 (ТЛ-13У), Л-1У1-01 pantographs for both AC and DC electric locomotives. It consists of a drum with beaters mounted on brackets which in turn are mounted on the carriage’s pantograph. The drum is driven by a rotary air motor. Air supply to the rotary air motor is supplied from the air line whistle (which is removed). Enabling Пневмобарабан devices occurs at a speed of at least 5 km/h and not more than 20 km/h. 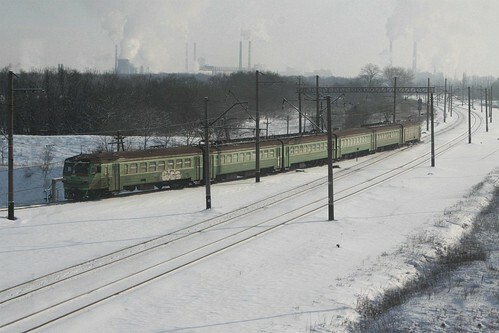 The velocity of the locomotive when removing ice from contact wires using the Пневмобарабан should not exceed 60 km / h. The Пневмобарабан compared with вибропантограф removes ice more effectively from the contact wires. The above instructions suggest that a vibropantograf can be fitted to any type of electric locomotive, which makes their appearance on a handful of ЧМЭ3 class diesel locomotive confusing. Perhaps special ice clearance trains are operated across the Russian Railways in order to keep the overhead wires clear? In the United States, the MAX light rail system in Portland uses secondary “ice cutter” pantographs on their light rail vehicles so that services can keep running through winter. An Italian company has patented an ‘ice breaking pantograph‘ in 2013 – with so much prior art around, I can’t see why it was granted! Finally, Finnish measure measurement company Vaisala markets an overhead wire ice detection system to warn rail operators of icing conditions before they cause trouble. It seems that the ice removal techniques in Russia aren’t 100% effective – sometimes they just say ‘screw it’ and keep running trains, resulting in a spectacular display of electric arcing as the train’s pantograph knocks the ice away. If the above wasn’t dramatic enough for you, here is a second dose. This entry was posted in Trains and tagged pantographs, railway electrification, railways in the snow, Russia, Russian Railways, snow, winter. Bookmark the permalink.